I’m continuously amazed at the evolution of Oren Miller’s legacy. 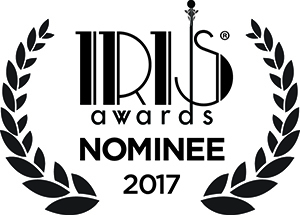 Last summer’s walk along Hadrian’s Wall (to open a camp in Oren’s name) recently received recognition at the 2017 Iris Awards. Winning in the Philanthropic Work of the Year category, now even more people are aware of Oren, Camp Kesem, and the cause to support families touched by cancer. The Iris Awards are given out at a swanky ceremony held in conjunction with the Mom 2.0 Summit. Nominees and voters are from within the parent blogging community, so it’s particularly meaningful to receive kudos from dear friends and respected colleagues. But it was also pretty amazing being honored alongside the 12 men I now consider my brothers. Being able to celebrate with them only amplified my excitement, as well as my pride in our achievement of walking nearly 100 miles and raising over $40,000. Check out the video of our award being announced (and of me speaking), beginning at the 24-minute mark. And the story has chapters yet to be written. The Camp Kesem started in Oren’s name at the University of Maryland is training counselors this fall, and will hold its first summer camp next year. You can bet I will be there, cutting a ribbon or rowing a kayak or whatever I can to celebrate my friend, his life, and the hope and strength for kids affected by their parents’ cancer. Lately I’ve been eyeing 50 as the age when I for sure have to start acting like an adult. And as graphic design and parent blogging are mostly a young person’s game, I dread my half-century birthday (which is still a couple years away, thank you) on multiple levels. For seven days in July, I and eleven other dads hiked 90+ miles along England’s historic Hadrian’s Wall. We walked to fund a camp for kids whose parents had been touched by cancer. We walked to honor our friend Oren Miller, who had died of cancer the year prior – and for whom the camp would be named. We walked for those in our own lives impacted by the disease, including several in our group. But we also walked for ourselves. The experience was exhilarating and exhausting, thrilling and tedious; breathtaking — both literally and figuratively. It was the undisputed apex of my year, and near the top of any other. Until now, I’d only shared about the walk on social media. Life and all its complications — and my perfectionist tendencies — kept me from documenting it properly here. But in light of the announcement that the University of Maryland Camp Kesem will officially come to be this fall, I thought it high time I collected my thoughts, memories, and images from that life-changing week in a more permanent fashion. I still haven’t decided if this can be done in one post or seven (or something in between), so bear with me as I return to the rolling hills of Northern England and allow this epic outing to re-unfold. Sometimes the big picture of parenting can be overwhelming. Taking the time to enjoy and celebrate individual moments is so important — a lesson I continually learn from my always in-the-moment son. This past spring, Jon played on his first baseball team. We were excited to have found a county league that emphasized fun and learning, with each practice ending in an unofficial “game” that only loosely adhered to big league rules. While never much of a jock myself, I have fantasized about being a Cool Sports Dad. The emphasis on “Cool” — not the hot-headed kind of dad that screams obscenities at umpires and such. There are plenty of other things to hound my kid about (flushing, for example), so Papa and I were looking forward to his first team sports experience being on the low-pressure end. The season had lots of stops-and-starts, with several rain delays and a week skipped for holidays, but the last game day finally arrived. Not unexpectedly, there was a much higher percentage of parents in attendance — and I imagine expectations (real or imagined) weighed heavier upon the players’ sweaty heads. I hung back for most of the game, only walking up to the fence to encourage and cheer when Jon was up to bat. The innings consisted of each child getting to bat once, with unlimited strikes until they got a hit. As the game wrapped up, it became apparent that Jon would be the final player at bat. Even with the loosey-goosey rules, my heart quickened a bit — nervous for him, excited for me (or probably the opposite). As a family with two dads, Mother’s Day can be challenging. It brings up questions from our son and can at times make him — and us — feel like an outsider. Yet even though he doesn’t have a mom, our son has inherited so much compassion, wisdom, and love from generations of great women. One of these women was my maternal grandmother, Louise McCullough. The photo above is of my grandmother, my mom, me and Jon from November 2010. Grandma Louise (or, more informally, Grandma Mac) had been in poor health, having undergone multiple stomach surgeries. She was in her mid 80’s and increasingly feeble, but continued to remain the strong, caring, opinionated matriarch she’d always been. If you’re looking for affordable family fun, look no further than Philadelphia. Our family got to spend four days with our up-the-coast neighbor; however, the first two were just me and my 6-year-old — a challenge I wasn’t sure I was prepared for. Under normal circumstances, my adventurously independent son is a handful. Now we were sans one dad, adding a train ride, a hotel stay, and a bunch of activities in a city I knew next to nothing about. Papa and I had spent an anniversary weekend years ago, focusing mainly on art museums and antiques. I knew my kiddo was having none of that, so we were in uncharted territory. It’s also important to note that Jon was not as over the previous week’s stomach bug as I thought. Known as the City of Brotherly Love, Philadelphia has plenty of affection for families and kids, too. We made it through the trip with lots of flying colors, great memories, and even learned a few things. And yes, there were lots and lots of trips to the bathroom. Here are our five Philadelphia favorites — along with a score for the restrooms at each location, based on their ability to accommodate weary, middle-aged dads and a kindergartner whose bowels were constantly at DEFCON #2. The initial draw of The Franklin Institute was the Art of the Brick exhibit — which did not disappoint. Yet on further exploration, the entire museum was amaze-balls, as the kids say. From the giant interactive heart, to the train factory, a planetarium, and pretty much any invention or sciencey thing you can think up — it had it all.